This work is accompanied by a certificate of authenticity signed by Maria Teresa Tosi, dated 17 May 2007 and numbered 514 in the artist's archives. 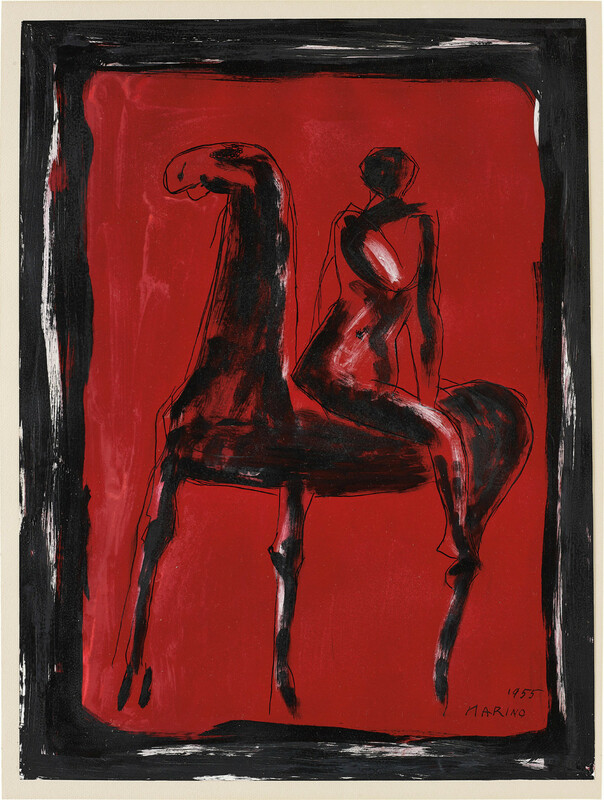 The image of a horseman is a recurring theme throughout Marini’s paintings, sculptures and works on paper, dominating his work from 1936 onwards. In the 1950s it was these playful, yet pensive, statues that solidified his fame. For Marini this theme was of vital importance, stating that ‘the entire history of humanity and nature can be found in the figure of the horse and rider’. Throughout Classical and Renaissance art equestrian representations were associated with notions of power and dominance. It was believed that if a man could control a horse then he could control a people and a nation. Marini studied much Etruscan work as well as that of early Renaissance artists Pisano and Donatello. One of Donatello’s most famed sculptures is the equestrian portrait of ‘Gattamelata’ in Padua. Marini takes the strength and expressive power of Donatello’s work, yet interprets the classical theme with a fiercely modernist touch. This ‘Cavallo e Cavaliere’ sits perfectly between Marini’s poised Cavaliere of the 1930s and his later works where figures are depicted tumbling off their horses. In ‘Cavallo e Cavaliere’ the man and beast are disjointed, so much so that the figure is twisted and turned away from his horse. Oblivious of the creature beneath him, the rider is focused upon his own anxieties. Working at a time when society was still coming to terms with the ramifications of World War II, Marini used this image to show man and nature being out of harmony. Born in Pistoia, Italy in 1901 Marini studied at the Academy of Fine Arts, Florence in 1917. His works are held in many leading international collections such as Peggy Guggenheim Collection, Venice, Tate Collection, London, Hirshhorn Museum, Washington, National Galleries of Scotland, Edinburgh and Museum of Modern Art, New York. The Museo Marino Marini in Florence is entirely dedicated to the artist’s work.